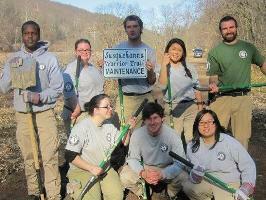 Folks are buzzing about the volunteer work taking place in Susquehanna River communities. Eleven National Civilian Community Corps (NCCC) members have conducted flood cleanup work in Shickshinny, and will soon help Berwick, Bloomsburg, and Falls. The Susquehanna Greenway Partnership applied for the team in partnership with the Appalachian Coal Country Team. The volunteers will be working in our area from March 12 - April 4 before moving to other parts of Appalachia. The volunteers spent a day assisting the Susquehanna Warrior Trail Council and removed litter and debris from the walking and biking trail. They also used shovels to scrape away flood mud that coated much of the trail. "What an extremely great bunch of young men and women," exclaimed Warrior Trail Council member Lance Kittleson. "They worked so hard all day long and we really accomplished more than we thought we could in a day with their help. We cleared over 1,000 ft of dried mud off the trail, picked up litter, cleared brush, and they assisted in recovering historical remnants of the old bank building for the local historical society." 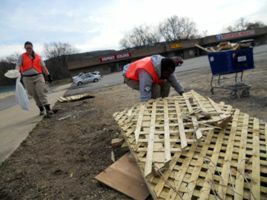 The team also spent a number of days beautifying the downtown area of Shickshinny by sweeping up debris and chasing down litter. "The community has been wonderful, people were literally stopping us on the streets to thank us," said volunteer team leader Patrick Skovira. "It has been great to help these communities make a dent in their flood recovery and to help them get their public trails, parks, and riverbanks back to a place where people can use and enjoy them." The volunteers will spend four days in Berwick conducting riverbank, litter, and brush cleanup in Test Track Park. The team will assist with recovery work in Bloomsburg’s Town Park, which has been closed to the public since the flood. Finally, the volunteers will assist with riverbank cleanup and local playground restoration in Falls. Follow the team's progress on our facebook page!